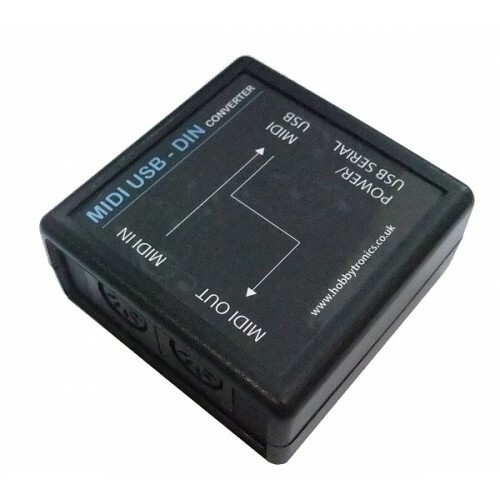 The MIDI USB to DIN Converter allows you to connect a USB midi device to standard MIDI equipment that uses 5-pin DIN connectors. Many MIDI devices now connect via USB, but if you don't have the facility to accept USB devices in your equipment, then this adapter will convert the USB device to standard MIDI DIN connectors. So you can connect a USB peripheral (such as a keyboard or synthesizer) to older equipment that only has a 5-pin DIN connector (such as an amplifier). It translates the USB MIDI data packets to/from MIDI Din at the MIDI baud rate of 31250. Some Complex MIDI devices use a built-in USB Hub. These MIDI devices are not supported and will NOT work with our MIDI USB - DIN Converter. 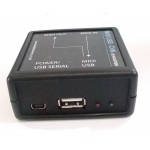 You can determine if your device has a built-in hub by running the free Windows program USB Tree Viewer. 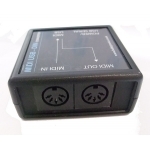 If, when you plug in your MIDI device it appears as a new Hub plus one or more devices then it will not work with our MIDI - USB Din Converter. [NEW] - As of software V1.18 command mode is now inactive by default. 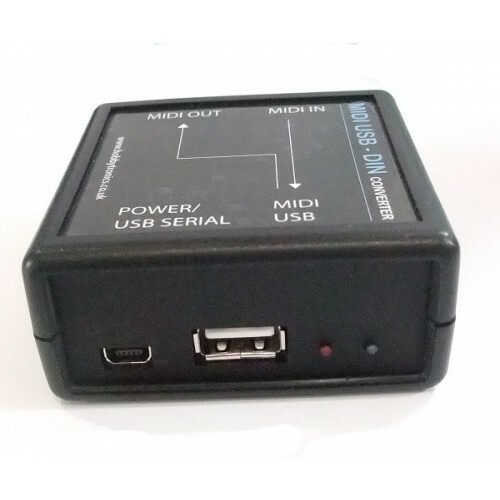 The reason is that if you have the converter connected to MIDI IN and MIDI OUT but no USB MIDI device attached, then serial MIDI IN data received would be echoed back out on MIDI OUT. Configuration is not necessary for normal operation, however the following Configuration commands are available. Connect the MIDI Converter to a computer using the supplied mini-USB cable and run a terminal program set to 31250 BAUD. The Help screen and configuration settings can only be made when there is no MIDI device attached. The FILTER option allows you to block ALL incoming MIDI channel data received on the MIDI DIN IN connector EXCEPT for the MIDI channel selected. 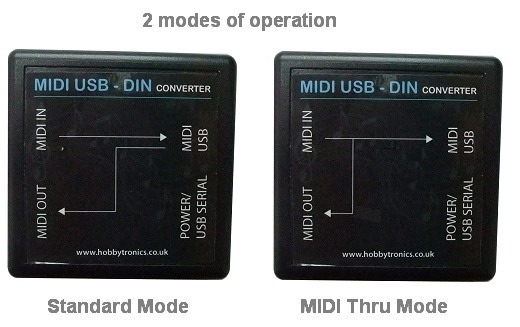 If you only need to send midi data to the attached MIDI USB device, you can can use the MIDI OUT port as a THRU port (see diagram below). To load the new software we use the free ds30loader application. You can download a copy from our website here. From the Menu select "View" "Advanced Mode"